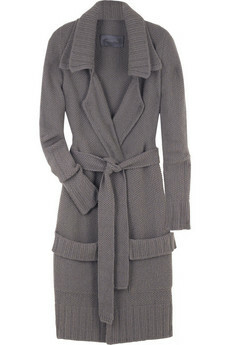 Vince long cashmere cardigan, $285. Intermix. 12th Street by Cynthia Vincent brown cardigan, $385. Shopbop.com. I’ve been quite obsessed with oversize boyfriend cardigans lately; quite evident to anyone who’s seen me out and about in the past few weeks. But I hadn’t realized how “daunting” they can seem to pull off. Oversize sweaters are just a brilliant choice to tone down a dress, contrast skinny jeans or wear belted for a casual and seemingly effortless look. My of-the-moment obsession is belted with short dresses, worn with tights if it’s cold enough or knee-high/over-the-knee socks if you dare. The other trick to pulling off this look: Buy your size! I know, seems logical enough, but usually they already come fitted enough so that you don’t need to go larger, OR smaller; it’s supposed to be big and loose and comfy, just not as big as your boyfriend’s actual sweater. Here’s a few of my favorite cardigans right now with full-looks on how to wear them. You can also see Monday’s post for my own rendition of the belted cardigan over dress look. I really love how wearable the trend is for both day and night and worn with pants, dresses, belted or loose. There’s about 100 million ways to wear them, so have fun with it! Worn loose with black skinny pants. 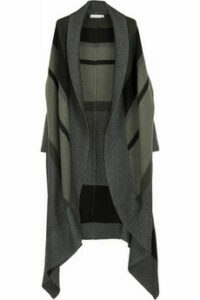 Stella McCartney oversized striped cardigan, $2,795. Net-a-porter. Belted over a short dress. 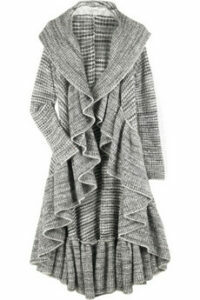 Diane von Furstenberg tweed knit cardigan, $885. Net-a-porter. Worn belted over pants or loose over pants. Tomas Maier, $1,127. Donna Karan, $1,800. Both Net-a-porter. Shown loose over short dress and opaque tights. Halston gray cashmere knit cardigan, $1,995. Net-a-porter. Obsessions: Stilettos and Booties, Oh My! I love these looks. So perfect for AZ, too. Not too heavy. I tried to buy those gray boots but they were all sold out. 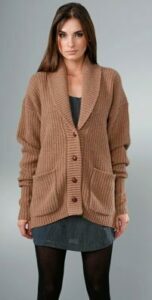 I wish I had a boyfriend to lend me his cardigans.